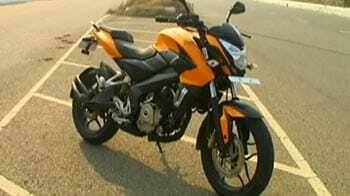 *Actual On Road Price of Bajaj Pulsar NS200 at the dealership may vary. Bajaj Auto today officially launched the new 2017 Bajaj NS 200 ABS in India priced at Rs 1.09 lakh (ex-showroom, Delhi). The company started dispatchingthe bike towards the end of September 2017 and the new NS 200 ABS is now officially available for sale in all Bajaj dealerships across India. While dealers have been accepting bookings for the bike since the end of September, deliveries for the bike started around Diwali, in October. The bike continues to rival the likes of KTM 200 Duke, TVS Apache RTR 200 4V, and the Yamaha FZ 25. Pulsar 200 is one of the modish looking variants in the Pulsar range which comes loaded with a 199.5cc, four-stroke, SOHC, 4 valve engine. The liquid-cooled single cylinder engine offers 23.17 bhp at 9500rpm and 18.3Nm at 8000rpm.Pulsar 200 NS reaches zenith in terms of speed at 135kmph and sprints to 60kmph from rest within 3.1 seconds. Based on the pressed steel perimeter frame, the bike has a kerb weight of 152kgs. Telescopic front forks and mono-shock nitrox rear suspension ensure balancing the bike and stopping force is produced by dual petal disc units. For 2017, Bajaj Auto has updated its entire range of Pulsar motorcycles - with updated engines meeting new Bharat Stage IV emission norms and the automatic headlamp on (AHO) function. And along with some minor design tweaks here and there for the entire range. Nice look and sport bike, thanks bajaj team ?